“The Clavioline keyboard was on the UK market before the Univox.. Clavioline originated in France and was imported for the British market by the UK/French company “Selmer” (based in Charing Cross road, London). Their main product were woodwind & brass instrument sales. They were not really into electronic products though the Clavioline was a good product. It was also expensive. Tom Jennings saw the market potential and already had a good slice of the keyboard sales for accordions etc. Tom found a local electronic engineer, Les. Hills, who studied the Clavioline and designed another circuit different to the existing French patent. Unfortunately the product was not at all reliable, with most units breaking down almost as soon as they got to the end customer. Some of this problem was due to instability in the earlier circuit design but mostly due to choice of suitable components and mechanical shortcomings. Les had only been employed for the circuit design. The mechanics having been cobbled together by the accordion service men at the time. I was head hunted by Tom to sort out the reliability problems. This took a few months of circuit, component testing plus improvements to the mechanics. This was in 1951 period. In about 1951/1952 the Univox took off in a big way due to its competitive price and Tom’s country wide marketing program. 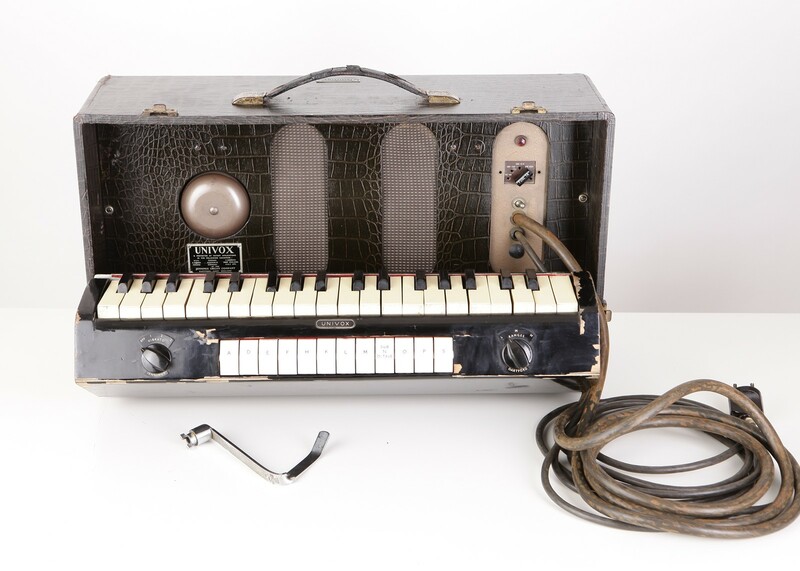 The first version was the J6, single keyboard model, later followed by the J10 with two rows of Tone & effect tabs. All models were supplied with metal screw-on clips, to fasten it under the right hand side of a piano. Later we designed an adjustable chromed stand that enabled the user to do gigs in other locations with out having to screw on fixing brackets each time. Most customers in those days were either Pub owners or pianists playing Pub gigs. The Univox keyboard had a unique a double contact system under the key allowed basic control over the note shape – striking the key harder caused a thyratron impulse generator make a shorter decay, creating a staccato effect, striking the key softly gave a long decay of up to two seconds. A vibrato oscillator was also provided to modulate the output and also to retrigger the thyratron tube to create ‘mandolin’ type repeated notes. 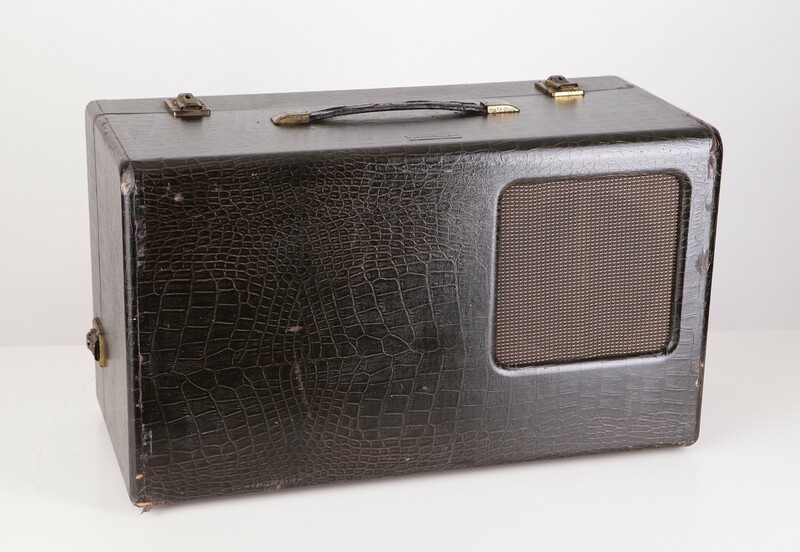 The Univox’s front panel consisted of fifteen switches to further control the timbre of the instrument, three vibrato controls, a thryratron modulation control and an overall knee operated volume control. I have an Univox model J6 part no 3435. It works, just about, with very little volume. I want to know if it is worth getting repaired and if so what would it be worth, if anything, today. Hi Ed , I’ve recently obtained a univox j6 and have been trying to work it out. All powers up but nothing coming out of speaker. Is there a volume control somewhere ? Also did you get yours repaired and if so I would appreciate a contact if possible. If anyone else is reading this I would appreciate any help. Steve, I have the J10 model which I periodically fire up and try to figure out what does what. Your volume issue might be that you are not using the volume lever that attaches to the underside of the keyboard. Anyone tell me where the volume control is on a j6 univocal and who or where I might get it repaired ?